…introducing her to academic and musical rock stars. Although she hasn’t won a Grammy or performed in sold-out arenas, Elizabeth Tanenbaum is a rock star. And she owes her success to UW-Green Bay. Once her academic path was clear, Elizabeth credits Ellen Rosewall for “facilitating the opportunity to participate in creative activities within the arts and facilitating the opportunity for others to be creative.” Ultimately, this emphasis on creative endeavors allowed Elizabeth the chance to work with one of her favorite musicians, rock star Willy Porter. “Professor Rosewall always encouraged community engagement. For an assignment, we had to create an earned income project, develop a budget and a marketing plan. She encouraged us to truly research the budget, make phone calls and speak with professionals about the project,” Elizabeth explains. “I chose to hold a concert (theoretical, for the project) and chose one of my favorite musicians, Willy Porter, as the performer. Upon Ellen’s recommendation, I called Willy Porter’s manager and she was incredibly helpful. Fast forward to graduate school at the University of Oregon, and Willy Porter was playing at a local venue. Of course I went, and following the performance, I went up and introduced myself to Willy. I told him how helpful his manager had been for my project for Arts Management and thanked him for that. He replied, ‘I remember you and your Arts Management class! What a cool assignment and great learning experience for an aspiring arts leader!’ I was star struck.” After two years of studying with Professor Rosewall in the Arts Management program, Elizabeth applied for and was awarded a prestigious internship with the country’s largest arts advocacy organization, Americans for the Arts, an internship that provided her with practical experience to help launch her career in Arts Management. Upon graduation, Elizabeth was awarded the Chancellor’s Leadership Medallion in December 2005 and was the Commencement Speaker at the December 2005 graduation. 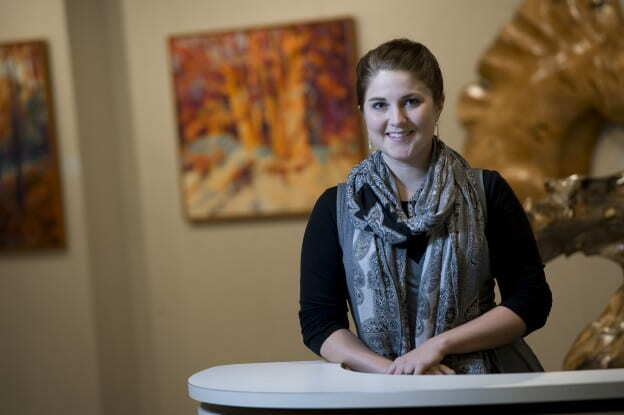 Knowing that she wanted to pursue continued education in Arts Management, Elizabeth applied and was accepted to the Arts Administration Master’s Program at the University of Oregon, one of only ten students accepted that year. Elizabeth’s Master’s research was published twice in scholarly journals and, following graduation, she was offered a position as Public Art Manager for Clackamas County, Oregon. After a successful tenure there, Elizabeth returned home and, for the past five years, has served as the Executive Director for New Visions Gallery located at the Marshfield Clinic. Now, things have come full circle for Elizabeth: with Professor Rosewall listed on her CV as a reference and in her cover letter, she will be teaching Arts Management full time at the University of Oregon. This entry was posted in Shared Stories and tagged #transformationtuesday, Arts Management, Musical Theatre on March 1, 2016 by stalumni.